Several months ago Ben Vincent sent me many pictures of Old Dominion Area Council camp emblems. The Fourth of July weekend has finally given me time to add a few of them, including the patch pictured above that Ben advises was used for Camp Waters in the early 1950's. Since it doesn't have the Camp Waters name on it I have always assumed that it was an early Council patch for ODAC. 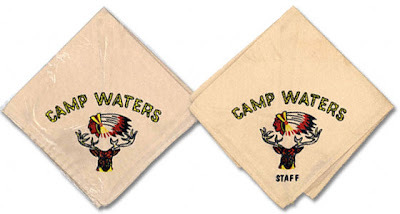 Ben also provided pictures of the neckerchiefs used at the camp during the same timeframe. It's interesting to note that the Indian profile and deer design were later adopted by the Council's OA Lodge for the totem on their patch designs. I've added pictures of these items to the Old Dominion Area Council Camps page and will be adding more soon.